If your small kitchen leaves you feeling pinched for space, these nine ingenious ideas will help you make the most of your tiny layout. Don't have a pantry? No problem. You can use mason jars to create the storage you need on a blank wall. You know how products like flour, pasta, and even dog treats come in different sized packages? 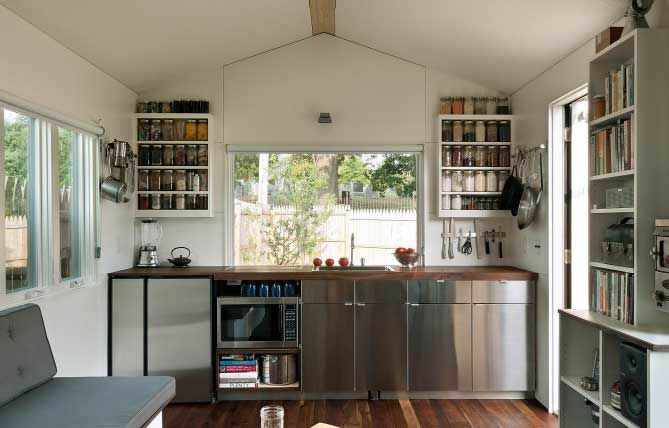 The Minim Micro House brings order to storing dry foods like these by pouring each one into a separate quart-sized mason jar. Each jar is then placed in one of the two kitchen racks shown above. Each rack can accommodate 25 quart-sized mason jars. DIY Home Girl is one of my favorite small space living sites. The crafty chica behind this clever blog transformed a tiny nook in her small kitchen by adding pegboard storage and bonus counter space. Drawers can be powerful organizational tools. Designating one as a holding pen for random odds and ends is a tremendous waste of precious kitchen real estate. It also enables you to accumulate clutter. Like to cook? Transforming your junk drawer into a spice drawer may be a better way to go. Not only can this idea free up cabinet space, but keeping your spices in a well-organized and easy to reach spot can make cooking easier. This DIY kitchen island by Instructables user MeJones provides extra counter space while creating a spot to store up to 18 bottle of wine. Open shelving is a smart storage solution for small kitchens that do not have room for standard hanging cabinets. As a bonus, shelves like these make it easier to grab dishes, glasses and mugs. The home design team, Charles and Hudson, installed the open shelves shown above. This DIY wall plate rack by Meg and Trevor at Oliver and Rust is an attractive storage solution for over-sized items like platters and cutting boards. Erin and Dan from the site, Halifax Bloggers, created a rolling pantry that could fit in the sliver of space between their kitchen wall and fridge. Here's another spicy idea for tapping unused space. Jessi from the pragmatic home decor blog, Practically Functional, created a magnetic spice rack that fits on the back of a kitchen cabinet door. This hack turns an Ikea Expedit shelving unit into a kitchen storage system that packs a pull-out table. Note: This year Ikea discontinued the Expedit series. But have no fear, you can DIY the project shown above using components from Ikea's Kallax series.